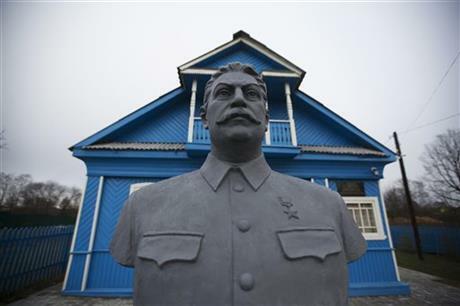 KHOROSHEVO, Russia (AP) — A bust of Josef Stalin stands on the front lawn of a house-turned-museum in this small village, where the Soviet leader is said to have stayed the night on his only visit to the front during World War II. Inside, the museum director, a sturdy woman armed with a wooden pointer, takes a group of preteen students around the two-room house where Stalin strategized with his generals in August 1943 as the Red Army battled to drive out the Nazi troops. Scholars estimate that under Stalin more than 1 million people were executed in political purges. Millions more died of harsh labor and cruel treatment in the vast gulag prison camp system, mass starvation in Ukraine and southern Russia and deportations of ethnic minorities. But as Russia faces isolation abroad and deepening economic troubles at home, retelling an abridged account of triumphs past has become increasingly fashionable. President Vladimir Putin frequently cites the Soviet victory in World War II — Stalin's most touted achievement — in vowing to stand up to the West and defend Russia's interests.